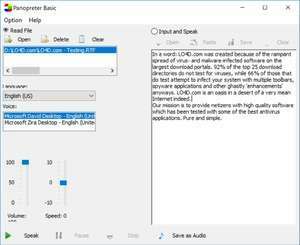 Panopreter Basic reads text, text file, rft file, web page and word document with natural sounding voices, and converts the text and files into spoken audio files in wav and mp3 formats. User can adjust voice volume and speed. The word or sentence being read will be highlighted. Support batch files conversion, support a wide variety of languages and voices, support UNICODE fonts. Version 3.0.92.7 is a freeware program which does not have restrictions and it's free so it doesn't cost anything. For security reasons, you should also check out the Panopreter Basic download at LO4D.com which includes virus and malware tests. Additional screenshots of this application download may be available, too.